Recently, Colgate-Palmolive sent me a tube of Colgate Optic White Platinum High Impact Toothpaste to try. The first thing I noticed was the refreshing, clean way it made my mouth feel. Much more than mouthwash does! The taste is refreshing in a concentrated, yet not overpowering, way. Another perk is that it clings to the toothbrush, unlike other pastes, that slide off. The claim is to get your teeth 4 shades visibly whiter in 6 weeks and you should start seeing results in just 3 days if used twice a day. I have only been using it for about 8 days and I can already see an improvement. By Valentine’s Day I should have a brighter smile! Your smile is usually the first thing others see when you meet. Make it the best it can be! The Colgate Optic White High Impact White Toothpaste formula is professionally designed with Hydrogen Peroxide. This simple routine will give you a whiter, brighter, and bolder smile. In addition to being safe for daily use, this product protects your enamel and contains anti-cavity fluoride protection. 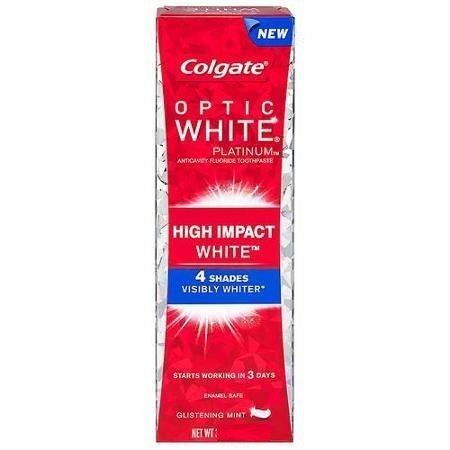 You can find Colgate Optic White Platinum High Impact Toothpaste at mass food and drug stores nationwide for a suggested price of $3.99-$4.99 for a 3 oz. tube or $5.79-$6.99 for a 4.5 oz. tube. As we couponer’s know, Colgate-Palmolive is always very generous by supplying us with money-saving coupons via the Sunday newspaper. Combine your coupons with sale prices, and you’ll be able to try this wonderful tooth brightener yourself for less! You’ll be happy you did.